Emphasizing the relationship between human biology and emotion, Jamie Bates Slone creates work that is a reflection of her memories of her family’s history with physical and mental illness. Using the human figure as a metaphor, she is able to convey sentiments often correlated with life and death through scale, charged surface treatments and uneasy body language. Her surface choices derive from diagnostic imaging of the human body, focusing on their color and visual texture. Jamie’s intent is for the viewer to imagine the surface of the skin as a reflection of what is happening inside the body and mind. Originally from Kansas City, MO, Jamie currently resides in Helena, MT. Jamie earned her MFA in ceramics from the University of Kansas in 2012 after completing her BFA in studio art in 2008 at the University of Central Missouri. 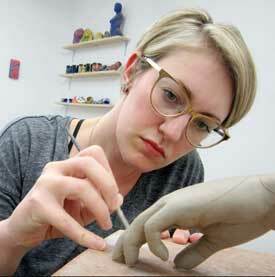 She has been an artist in residence at Red Star Studios, Epic Clay Studio and Studio 740.